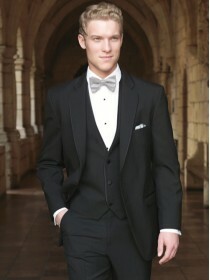 The black Allure Men tuxedo is the most classic and formal of the color options within this incredib.. 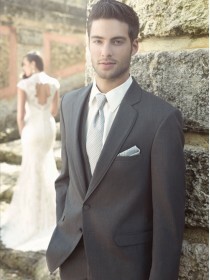 The steel gray Allure tuxedo was expertly and aptly created in response to the growing dem.. 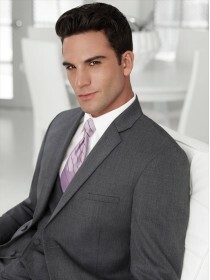 The steel gray Ceremonia suit is a wonderful option for any formal event. Fashioned from a contempor.. The heather gray Savoy is an eye-catching formal crowd-pleaser. Fashioned from an incredible gr.. Whether you're suiting up for your prom or your Golden Globe, the white Savoy has everything you nee.. The black cutaway is a timeless formal staple. The cutaway tailcoat is the centerpiece for the.. Regular Suit Length Slim Fit Self Notch Lapel Besom Pockets Two Button Front .. The charcoal gray cutaway is a timeless formal staple. The cutaway tailcoat is the center..